There is one minute left in Thursday. One minute left in Thursday, the 31st. One minute left in March. Which means there is one minute left in the first Quarter of the year. As per the “Project Schedule and Milestones” contained in Appendix F to the November 18th 2010 Term Sheet, the deal to keep talking (until conveniently just after the next provincial election) about maybe building a dam at Muskrat Falls, the document which Shawn Skinner won't post on the DunderGov website for reasons that are best asked of Shawn Skinner but have not yet been asked... this quarter, which has probably expired in the time it has taken you to read this far, was the quarter in which the Joint Review Panel Hearings were to have been completed. So, in one minute, the Danny Williams Memorial Project will be behind schedule. MR. KENNEDY: Mr. Speaker, today is a day that brings with it, for some, reminiscing, for others, celebration, and for others, disappointment. However, despite the efforts of Prime Minister Harper and his government, we will not give up. We will not be beaten down. We are a resilient and a tough people. That comes from living by this sea for 500 years and fishing off its coast, and we will continue to make our place. MR. KENNEDY: Mr. Speaker, approximately $383 million of the projected deficit for this fiscal year is related to the impact of stock market declines on the value of our pension funds. More than half of this deficit, $414 million, can be attributed to the unilateral action of the Harper government to eliminate benefits under the 1985 Atlantic Accord. The federal government, Mr. Speaker, in its recent budget, imposed a massive cut on just one province, and that province is ours, contravening a long-standing agreement they had made with Newfoundland and Labrador. We as Newfoundlanders and Labradorians are outraged that, after working so hard to achieve a greater measure of fairness and self-reliance in this federation, we are now being punished for our initiative. Were it not for the actions of the federal government and pension fund value declines, we would be forecasting a surplus. MR. BUCKINGHAM: The Progressive Conservative Party has, for all my years of involvement, represented the political beliefs that I hold. When it veered too far I made my views known and worked from within to make change. In 1987, as President of the PC Association for St. John’s East, I rose on the floor of a provincial meeting to ask then Premier Peckford if he had a business plan, some projections, anything that I could bring back to the good people of St. John’s East to justify the sinkhole that was known as Sprung Greenhouse. The Premier of the day was somewhat indignant that anyone would make such a challenge and told all assembled, not only did he not have that information but we would just have to take his word for it. My response was to rise and say: Mr. Premier, with all due respect, sir, that just is not good enough. Political suicide for a young district president perhaps, for I would have been better off to say nothing perhaps also, but the important question is: Do I have any regrets for having so long ago on that sunny day in Lewisporte having stood up for what I believe? Mr. Chairman, I have none, but I am sure that had I said nothing I would be kicking myself to this very day. So the question became: What now? Does one leave the party? That seemed to be an easy choice, but it was my choice not to leave. Rather, I resolved to make St. John’s East a stronger district, more prepared for whomever the next PC candidate was. While the PC Party of the day may not have represented the full of my political value system, it held enough, and let me assure you, Mr. Chair, the alternative held none. In October of 2003, the federal PC Party announced its attention to emerge with the Alliance Party of Canada. I let this development digest for about two weeks and was finally forced to realize that this turn of events not only caused me a great deal of discomfort, it made me nauseous. On September 2, 2003, I resigned from the executive of St. John’s East, stating that this merger is the death knell of the political values that the PC Party has represented and Peter MacKay is pulling the rope. This time, Mr. Chair, the party left me and I am was not going to follow it. Mr. Chair, while I am proud and anxious to be any part of an ABC campaign for the next federal election, and I fully support anyone who is willing to jump on this bandwagon which is being so well driven by our Premier, I stand in this House to contend that I was one of the first to lead this bandwagon out of the barn. Mr. Chair, words are words, principles are principles, and as the Prime Minister has so clearly shown, words can be twisted and changed. Principles, however, can only be abandoned. Now some people have suggested that the federal government has no principles and this is a grossly unfair statement. The federal government does have principles. Unfortunately, they are principles any parent would be ashamed to pass on to their children. Mr. Chair, the PC Party, my party, prides itself in being open and democratic. The recent election has only served to strengthen my faith, not only in this principle, but in this party’s resolve to enact the principle. This is a party and a leader who not only talks the talk, but walks to walk and insists that the democratic process should unfold as it should. In just a few months my faith in what I believe this party represents, my faith in how I thought a new member would be treated, and my faith in this party’s overarching desire to choose improving the lives of every resident over political expediency has been rewarded. Any resident of this Province would be greatly heartened to be in our caucus room, as I witness the commitment of our members to this Province. Every government member has a full voice and that opinion is considered and considered fully. While it is fair to say that this accepting and opening - and I know that the hon. members opposite may have a problem with this. While it is fair to say that this opening and accepting environment stems directly from a leader who insists on it being thus, I also suggest this stems more directly from a party who would expect no less from its leader. On September 3, 2008, Danny Williams sent an email to his caucus, asking them to pledge their loyalty in his Holy Sacred War Against Canada. This email somehow made its way to the CBC, which posted it on its website – that link being wonky at best, here’s a more stable link to the full e-missive. This is a screen cap of the headers: Notice anything? The email was sent on September 3, 2008. 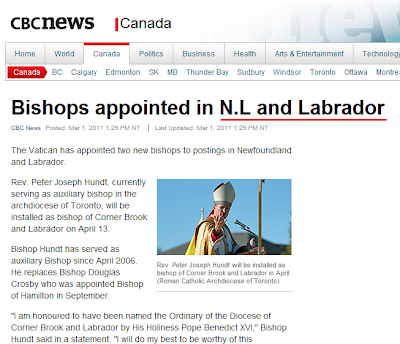 This was just days after the by-elections in Baie Verte–Springdale and Cape St. Francis, so most of the Kevin Kaukus were not yet officially Members of the House of Assembly, and didn’t have MHA email addresses. Obviously, Danny Williams didn’t need to send an email to Danny Williams, because Danny Williams already knew where Danny Williams stood on Danny Williams’ Holy Sacred War Against Canada. So that leaves just one Progressive Conservative MHA who is not in the to-line of the email. Just one. See if you – not you, Ed Hollett, anyone else – can spot the missing member. And having spotted the missing member, ask yourself: why might that particular member be missing from such a politically-charged email? MR. RIDGLEY: All positive things for this Province. Instead, they have chosen to use the word confrontational and to imply some negative effect to the stand that is being taken by the Premier. Madam Chair, even if we use the word confrontational, there are times that people have to be confronted. For example, we confront people in the courtroom. A person is confronted by the fact that he was seen at the scene of the crime holding the gun. He has to be confronted with that evidence. Madam Chair, the Prime Minister of Canada has to be confronted with the fact that these are his words when he talks about: We will leave you with 100 per cent of your oil and gas revenues. These are the words of the Prime Minister, Stephen Harper, when he says: 100 per cent of your resources, no small print, no excuses, no caps. Once again, the Prime Minister needs to be confronted. If that is what confrontational means, I say let’s go for it. Let’s confront him with the fact that he said no small print, no excuses, no caps. And we have our three Conservative MPs up there who also need to be confronted. If that is what confrontational means, let’s confront them with the fact that they need to stand up for this Province and not say that nothing is being lost. Something is, in fact, being lost. Something will be lost a couple of years down the road. MADAM CHAIR: I remind the hon. member that his speaking time has expired. MR. RIDGLEY: … I believe the Member for Port de Grave stood up the other day and said - maybe I misheard him - that the population in his area was growing. I believe that is what he said. So it is not altogether black in the Province, Madam Chair, despite the rants and raves and the hollow yelling that I hear from across the floor. I would remind some of those who are yelling at me right now, it is always the hollow base drum that makes the loudest sound. The House of Assembly has helpfully posted the Citizen's Representative's report on the Investigation of Psychiatric Services in Provincial Correctional Facilities. This born-digital document – it wasn't typed on foolscap carbon using an electroball — has been printed, scanned in full colour, and posted, in all its 39 bloated, colourful, non-searchable, 17-meg glory. Mitigating factor: at least they forgot to put security locks on the file. This time. MR. T. OSBORNE: Do you know why we should not be faced with having to make that decision? Because of the promise that the Prime Minister has made. MR. T. OSBORNE: Mr. Chair, these are the words of Prime Minister Stephen Harper when he said, "This is a commitment that was made by me in my capacity as leader of the Canadian Alliance when I first arrived here and has it origins in the intentions of the Atlantic Accord signed by former Prime Minister Mulroney in the mid-1980s. These are longstanding commitments, our commitment to 100 % of non-renewable resource royalties. It was our commitment during the election, before the election, and it remains our commitment today." Well, what happened, Mr. Chair, to his commitment, when you have a Province like Nova Scotia who has pulled out of the Atlantic Accord, and a Province like Newfoundland and Labrador who have to seriously consider our options? It is a broken promise. Quebec is a party, and hardly for the first time, to a document which expressly recognizes the interprovincial Labrador boundary. What ever will the mythmongers do now? Mr. Speaker, I stand today to read a Private Member’s motion and one that I do, I might add, with great regret and great disappointment. It is something, actually, that I remember - before I read it in, I will just have these few words. When the federal election was on over the Christmas season, Mr. Speaker, of course during the Christmas season you have the privilege to see a lot more people than normal, you visit a lot of homes and a lot of places. One of the things that I ran into was people’s fear of Prime Minister Harper, their concern about him, the concern about some of his views. Mr. Speaker, I was one of the people who looked these residents in the face, looked them straight in the eyes and told them: Look, there is one thing we can be assured of with Stephen Harper, he does what he says, number one; and number two, he is committed to removing non-renewable resources from the equalization formula. That was one of the things, unfortunately, that I boasted him up. Mr. Speaker, I was one of the people who looked these residents in the face, looked them straight in the eyes and told them: Look, there is one thing we can be assured of with Stephen Harper, he does what he says, number one; and number two, he is committed to removing non-renewable resources from the equalization formula. That was one of the things, unfortunately, that I boasted him up. I thought that he would be a man of his word, Mr. Speaker. I am sad to say today that I am reading this Private Member’s motion in and explain some of the reasons why I made the statements I did to residents in my district, and in particular close friends of mine who had reservations about the current Prime Minister, and it was me who said to them: Look, he is removing non-renewable resources. This is significant to this Province. You cannot measure the value of it. MS JONES: The government is dodging the question. They do not want to explain to the people of this Province why they have done a deal that is going to cost them twice as much for electricity in Newfoundland and Labrador than what it is going to cost to the people of Nova Scotia. Mr. Speaker, Nalcor and SNC-Lavalin announced last week that they finalized a contract to design and build the Muskrat Falls power station. Now that the contract is finalized, I ask the Premier today: Will you release the details of the agreement or are you going to continue to keep the information secret from the people of the Province? MR. SKINNER: Mr. Speaker, this government has been very open in terms of the information that is made available through the Lower Churchill project. There is information available on the Natural Resources website, there is information available that we filed with the Public Utilities Board, there is information available through the environmental hearings that are going on up in Happy Valley-Goose Bay. There is all kinds of information that the Premier has tabled, not once but twice here on the floor of the House of Assembly. There is all kinds of information that we have put out there, Mr. Speaker. We are certainly not a secretive government. Ah yes. The Natural Resources website. The website where they have openly posted all kinds of “information” about the terms sheet signed with Emera… except for the terms sheet itself. Which, however, the intellectually adventurous can read, and even download, over here. You’re welcome. Presumably the recovering Premier would already have the personal cell numbers of his friends in his own former cabinet in his personal Rolodex. Why would he even want or need any other cell numbers? The official report of the Humber West by-election has been published, and was so published only 34 days after the electoral event described therein. The previous outing, the Conception Bay East–Bell Island by-election, inexplicably took 89 days. That's nothing, though, compared to by-elections held during the previous legislature (and under previous Chief Electoral Officers), whose official reports ranged from 111 days (Labrador West, 2007) to a staggering 184 days (Placentia and St. Mary's, 2006). For some ungodly reason, the Elections Act gives the Chief Electoral Officer up to nine months to publish election reports, even in the case of by-elections which have at most a few thousand votes gathered among a few dozen polls. The previous general election report, for equally ungodly reasons, took almost nine months exactly for the CEO to issue. Much larger provinces with many more electors are somehow able to cut this time by two-thirds. Still missing in action are the financial disclosures from the two by-elections held during 2010. On another, totally unrelated note, did you know that Kim Il-sung is the "Eternal President" of the Democratic People's Republic of Korea, and has held the position for the seventeen years since his death? Maybe Kevin O'Brien is, metaphorically, if not literally — yet — getting his wish. MR. SKINNER: We make no apologies on this side of the House for doing good government business, I tell you that. Now, if the members opposite want to continue to get up and be nasty – that is what I will call it, being nasty – talk about what is going on in outside circles, party business; if that is where they are going, they are not going to go very far. The House of Assembly should really be about doing the people’s business. When you bring in partisan politics to people’s business, I think you are a little bit off-track – I think you are a little bit off-track. I will not go any further with that because I do not want to go down that track myself. I just want to make the point; I just want to advise the members opposite of where their focus should be. I would have thought after having a whole winter to think about what they wanted to come into the House and speak about, the last thing they would have been coming in to talk about would have been petty partisan politics, but obviously that is where they are. We will leave it at that – we will leave it at that. Fidel Castro said Tuesday he resigned five years ago from all his official positions, including head of Cuba's Communist Party, a position he was thought to still hold. The confusion apparently stems from the decision to put Shawn Skinner in charge of announcing the move. Back in November 2007, Newfoundland and Labrador Hydro, Hydro-Québec, and the Iron Ore Company of Canada announced a deal involving the generally little-known Menihek hydro plant in the northwest corner of Labrador. November 15, 2007 - Newfoundland and Labrador Hydro (NL Hydro), Hydro-Québec and the Iron Ore Company of Canada (IOC) announced an agreement today to supply electricity to the communities of Schefferville, Kawawachikamach and Matimekosh-lac-John, Québec. IOC built and installed the Menihek/Schefferville interprovincial electrical system in 1954 to support its mining operations and supply electricity to the Town of Schefferville. Through this agreement, NL Hydro and Hydro-Québec have assumed ownership of the Labrador and Québec assets and infrastructure respectively from IOC. Hydro-Québec has also purchased the distribution system assets for the Town of Kawawachikamach from the Naskapi Nation of Kawawachikamach. NL Hydro and Hydro-Québec have entered into a 40-year power purchase agreement to supply electricity to Hydro-Québec for its customers in Schefferville, Kawawachikamach and Matimekosh-lac-John. Hydro-Québec will purchase a guaranteed minimum of 40-million kilowatt hours annually from NL Hydro. Hydro-Québec will also reimburse NL Hydro for all operation, maintenance and refurbishment costs for the Labrador assets of the Menihek/Schefferville electrical system. Both NL Hydro and Hydro-Québec will enter into a contract with the current operator, Kawawachikamach Energy Services Inc. (KESI), a First Nations company, to operate and maintain the Menihek/Schefferville electrical system. The contracts will allow staff currently familiar with operations to continue, and will ensure continued involvement of the communities that are served by the Menihek system. The power generated from the Menihek Generating Station is the only source of electricity for this isolated area. The continued operation of the Menihek Generating Station will supply Hydro-Québec’s customers in Schefferville, Kawawachikamach and Matimekosh-lac-John, Québec with a safe, reliable and economic source of electricity. A couple of things worth noting. First, the use of the present perfect verb tense: “NL Hydro and Hydro-Québec have entered into a 40-year power purchase agreement”. Let's come back to that later. Second, the fact that the Williams Provincial Government did not issue any press release on the subject. This was rather a conspicuous omission, given that Danny Williams himself – along with he who shall not be named in Tory circles – announced the 2004 renewal of the Upper Churchill recall deal from 1998, and that Danny Williams himself, along with, six paragraphs into the release, announced the 2009 renewal of the recall agreement and the curious agency arrangement with Emera Energy. Himself also got to announce the Hebron agreement, just a few months before the Menihek announcement, and again with the notional Natural Resources minister relegated to the deepest, darkest, eighth-paragraph recesses of the press release. And just a few weeks later, there was Himself announcing the White Rose Expansion, with the notional minister making an appearance five paras in. There was Himself, taking full credit for the AbitibiBowater expropriation, in which certain resource and land titles in central Newfoundland were “repatriated” to the province from some unspecified location elsewhere in the world. In January 2009, Himself announced the deal to cleverly improve the Voisey's Bay project by delaying it, with herself again playing second fiddle six paragraphs down. And again in 2009, Himself announced the Hibernia South agreement, and yet again the notional line minister got buried in the fifth paragraph. So Himself has never been shy about taking credit for resource deals, resource mega-projects, super-duper-megaprojects, ultra-hyper-combo-maxi-do-diddley-megaprojects, or even marginal tinkering with existing agreements. But, conspicuously, the Menihek agreement, stands alone as an exception. His name was left out of it. No Minister's name, no government department, no one besides the two crown corporations and the private-sector dis-acquirer of the Menihek plant have any fingerprints on the deal. Well, at least not by Newfoundland and Labrador Hydro, Hydro-Québec, or IOC, on the day of the announcement. However, a provincial government regulatory body has quietly made the contract available to the curious public to examine, which means this corner can now furnish gentle readers with some of those curiously-undisclosed financial details. ii) an energy charge of $0.020 per kilowatthour (hereinafter referred to as the “Supplemental Energy Charge”) shall apply to all energy delivered above 40,000,000 kilowatthours in a Contract Year. The first sub-article gives Hydro-Quebec a volume discount on any power it needs above the 40-million kwh minimum purchase. The second sub-article indexes the prices to inflation – a concept likely better known to the general public as an “escalator clause”. So, starting in year one of the forty-year contract, Hydro-Quebec paid Newfoundland and Labrador Hydro three cents per kwh for most power, with the price dropping to two cents per kwh once the volume discount kicks in, and rising (or, conceivably, falling) since then, and for the life of the contract, in line with inflation. This makes the juice from Menihek almost as expensive as the “cheap” fourteen-cent per kwh stuff that would be transmitted from Our Dear Dam at Muskrat Falls. Refurbishment costs alone, over the 40-year life of the contract, have been estimated at $100-million. The cost of purchasing Menihek power, plus the other charges which Hydro-Quebec will absorb through this arrangement, mean that the consumer price of electricity in the Schefferville system, as per Quebec regulatory approval of Hydro-Quebec's rates for the Schefferville-area customers, is expected to soon reach the staggering level of... seven cents a kilowatt-hour. If you want “cheap” Labrador hydro power, sure, go ahead, build 14-cent Muskrat Falls. If you want really cheap Labrador hydro power... move to Schefferville. So, yes, there are lots of fascinating details in the Menihek agreement, which was published by a provincial government regulatory body. A Quebec provincial government regulatory body, that is. The much-maligned Régie de l'énergie, in fact, which published the Menihek contract as part of an application file-numbered R-3602-2006. And there, under the inconspicuous name of “B-1- HQD 1 doc 1” is the full and unfettered text of the Menihek agreement, in both French and English, with all of its fascinating provisions. And that includes the most interesting provision of them all – and here's where you will recall an earlier observation about the choice of verb tenses in the totally apolitical press release issued on November 15, 2007. It's the very first line of page 1, which says, in the English-language version, “THIS AGREEMENT made as of the 14 day of December 2005”. The French-language version, helpfully, agrees with that date. 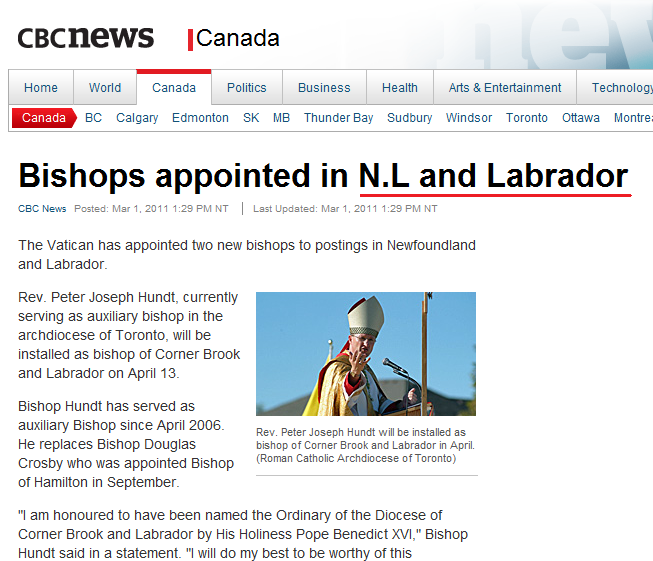 That's twenty-three months, almost to the day, before the date on the press release; which date in turn (and surely entirely coincidentally) was five weeks and two days after the 2007 provincial election in Newfoundland and Labrador. Rick Mercer has some good questions and good rants. It's just too bad that for seven years, he (among many others) turned a wilfully blind eye and a wilfully deaf ear as Danny Williams did, mutatis mutandis, THE EXACT SAME THING. What we can’t forget the human side of all of this, the effect it has on people and has on families. We can attack the decision without attacking the person, and that’s what I think has gotten lost here. The decision – whether it be patronage, whether it’s the right decision – we can have comments on that and we can have debate as we should. But when it gets to the point of attacking the person, like the attacks that have been made here in this case, I find it disheartening and I think it’s simply another reason why good people won’t enter politics. Remember: Jerome Kennedy was recruited into politics by Danny Williams. Jerome Kennedy supported Danny Williams. So when Jerome Kennedy cries crocodile tears over personal attacks, good people, and their families, well — the Joyce Hancocks of the world, the Quebec Lovers, the Traitors, the Eddiots, don’t they have families, too? The Opposition will attempt to claim victory; but on the contrary, they have shamefully created this debate for political purposes. I would have hoped that if Ms. (Yvonne) Jones was sincere about wanting a qualified person for this position she would have made a legitimate attempt to find out about my abilities as opposed to spreading inaccuracies. I can only hope that in this — an election year — those who are qualified, energetic and passionate about making this province a better place will not be deterred from taking part in the political process by the unnecessary negativity that sometimes occurs. This "unncessary negativity", of course, is to be contrasted with its equal but exact opposite, entirely necessary negativity. Each Member of the House of Assembly has the opportunity to hire a political assistant. Some members who are a part of Cabinet have the opportunity to hire more than one. The Premier, the Leader of the Opposition, the Leader of the NDP, all have the right to hire their political staff as they wish. Civil service positions on the other hand, Mr. Speaker, should fall under rules and regulations of the Public Service Commission. To do otherwise is an affront to the union movement and an insult to career civil servants. Contrary to remarks made by the Premier in a March edition of The Telegram, that the Liberals have not used contractual positions as a way of stacking the public service with Liberal supporters, I have to admit that just the opposite of this statement is true. Mr. Speaker, I want to ask the Premier today why his government continues to ignore the Public Service Commission and continues to find jobs for loyal Liberal supporters in the public service without going through a competition process? Mr. Speaker, last week we saw the appointment of the former Public Relations Director of the Premier’s office to the Bull Arm Corporation. While the Public Service Commission is not necessarily involved in the competition for such political appointments, it is normal procedure, I would think and I would assume that it is, that in appointing somebody to such an important position that some sort of search would have occurred to ensure that the skills set that you wanted, to ensure that the corporation achieved its objectives and goals in terms of attracting business to that site, were achieved. I would like to ask the Premier this question today: What sort of search did you undertake, as Premier of the Province, to ensure that the skills set that you required to keep the Bull Arm site up and running and going and attracting more business is the one that you got? In 2011, an election year, it is a threat to our very democracy when the opposition cries foul over patronage appointments. So, what was it when the current government, then the opposition, did the exact same thing in election year 2003? Legault's intensive probe of the Togneri case uncovered a so-called "purple file" process at Public Works, by which the minister's political staff reviewed potentially damaging access releases at meetings with the responsible public servants. "This purple file process creates a high-risk environment for potential influence or interference with ATIA release decisions and timely disclosure under the Act," her report found. Our reason for asking? Because the premier's communications director accidentally sent us an e-mail telling another staffer that she "will need purple files" on two reporters who asked for year-end interviews with the premier. Strange, then, that when we asked for copies of the files through Access to Information, we were told there were no records of any such documents - even though communications director Elizabeth Matthews confirmed to us in another e-mail "Purple files do exist, as I said before." Jones noted the Dunderdale government’s accompanying biography of Ms. Matthews, which it is using to convince the federal government to agree to make the former PR director the vice-chairperson of the C-NLOPB, falsely portrays her as the brain trust behind the Williams administration. “Her title was Director of Communications,” said Jones. The Liberal Leader said it is unacceptable that Kathy Dunderdale would appoint a former communications director to a position which should be filled by someone with expertise and experience in regulatory and marine safety issues. “I was incredibly honoured to accept this nomination which was offered to me by Premier Dunderdale. I never would have accepted the offer if I was not fully confident in my capabilities and the level of experience that I could bring to the C-NLOPB. I spent seven years as the Director of Communications and as a senior advisor to Premier Williams. In that role, I was a part of a team that advised the Premier and Cabinet on major policy and negotiations including energy and other projects. Despite Opposition Party claims to the contrary, I was also a part of the team for several projects related to offshore oil and gas development including the Hebron offshore development, the renewed Atlantic Accord, Hibernia South extension, White Rose extension and the Lower Churchill project. The slanderous assertion by the Leader of the Opposition that I “padded” my resume is both insulting and false. I think it is important that people in positions of leadership question the qualifications of those appointed to these positions - we should all be accountable to the public; however, Ms. Jones choose to attack me as a “flunkie” without ever discussing with me directly my true qualifications and capabilities. I have spent my entire professional career working alongside thousands of competent and dedicated people, developing progressive social and economic policy for this province, including in the area of offshore oil and gas. I was blessed to be a part of a team in Premier Williams’ office that I truly believe made this incredible province a better place to live and I know that my experience could have contributed greatly to the C-NLOPB. COFFEY, Q.C. : Ms. Matthews, would you tell us, please, give us a kind of a brief outline of your educational background and your professional background? MS. MATTHEWS: A. Sure. I graduated from Memorial University in 2000 and—or sorry, 1994 with a Bachelor of Arts Degree in Political Science and a minor in History. Upon completion of my degree I moved to Toronto for a few years and I worked there in the private sector. I returned to the province I guess around 1998 and I went to work with the Provincial Government and I’ve been with the province ever since that time working in a variety of departments, always in a communications capacity. I started in the Department of Mines and--former Mines and Energy, it’s now Natural Resources. I worked there as a communication specialist, which is a junior position. I then moved to the Department of Tourism, Culture and Recreation, also as a communication specialist but eventually was promoted to the position of Director of Communications. I then worked in the Department of Fisheries and Aquaculture, Education, in both of those departments as a director of communications and in 2003 I went to work with Premier Williams as his director of communications in the Premier’s office. COFFEY, Q.C. : And so you would have been a communications director beginning when, with the departments? MS. MATTHEWS: Oh, gosh, I guess it probably would have been around 2001, 2002, probably 2001. COFFEY, Q.C. : Okay, so your experience as a communications director then began in 2001 or ’02? COFFEY, Q.C. : In the first of those departments you’ve named. And then you have been a communications director in a department or the Premier’s office since that time? MS. MATTHEWS: A. That’s right. MS. MATTHEWS: I was just going to clarify that although directors of communications in departments are now public service and they have been since November of ’03, I myself am still a political appointment. Obviously, you know, the staff people in the Premier’s office, for obvious reasons, are politically appointed. So myself and the press secretary in our office are, we would pretty much be the only two communications people within government, with the exception of government members office, which is our government caucus, they also have communications folks; we would be the only politically appointed communications people within government. To be clear, I am not withdrawing because I feel in anyway incapable of performing this job, as I am incredibly proud of my professional accomplishments and gladly defend my abilities to the Opposition. But the politicalization of this issue has gone too far. The Opposition will attempt to claim victory; but on the contrary, they have shamefully created this debate for political purposes. I would have hoped that if Ms. Jones was sincere about wanting a qualified person for this position she would have made a legitimate attempt to find out about my abilities as opposed to spreading inaccuracies. I can only hope that in this - an election year - those who are qualified, energetic and passionate about making this province a better place will not be deterred from taking part in the political process by the unnecessary negativity that sometimes occurs. After a decade working under Danny Williams, she'd know all about the unnecessary negativity that sometimes occurs. 3.9.1 In the event that the Board, by a procedural resolution, has decided in advance on the voting method for a specific question or questions, then voting on all such question(s) shall be conducted in accordance with that procedural resolution. In the absence of any such procedural resolution, voting on a motion shall normally be by a show of hands. 3.9.2 The presiding officer shall have the same right to vote as other trustees. Where there is a tie vote, the question shall be considered as resolved in the negative. 3.93 A simple majority is sufficient to resolve the question in the positive at any meeting of the Board or of any of its committees. 3.9.4 All members who wish to participate and vote at regular meetings of the Board must be in attendance. Quite a bit of chatter this evening on teh Twitter about the decision of the Eastern School District to close MacPherson Elementary School in St. John's. The school board made its decision by secret ballot – not by open vote. How, you may ask, is that possible? 1.09 Except as otherwise expressly provided in these by-laws, questions arising at any meeting of the Board and Committees shall be decided by a majority vote of those present and voting. Where a vote is tied, the question shall be considered as resolved in the negative. All votes at any such meeting shall be taken by ballot if so demanded by any member present, but if no demand is made, the vote shall be taken by assent or dissent. A declaration by the Chairperson that a resolution has been carried and any entry to that effect in the minutes shall be admissible in evidence as prima facie proof of the fact without proof of the number or proportion of the votes recorded in favour of or against such resolution. The names of the mover and seconder of each resolution shall be recorded in the minutes. And how is this by-law possible? (3) A by-law of a board shall not come into force until approved by the minister. The by-law was approved (presumably by the Board) on August 17, 2005. It was amended on September 17, 2008. At the former date, Tom Hedderson was Minister of Education in the Danny Williams-Government, whose approval would have been required by subsection (3). At the latter date, if the secret-ballot provision was part of the latest amendment, the Minister was one Joan Burke. It is entirely possible, of course, that the secret-ballot provision is a relic of earlier by-laws of the boards which ESD is successor to. Either way, whether grandfathered or adopted de novo, the authorization of such a provision, by The Most Accountable Government Anywhere Ever, is mighty strange. Point of not-entirely-irrelevant interest: in May 2005, when Fabian Manning was spontaneously evicted from the PC caucus spontaneously and not in any way some cultish show of loyalty to The Leader, it was by show of hands. Monday's pre-budget "consultation" in Hawke's Bay was postponed due to weather. The February 14th pre-budget "consultations" in Labrador were simply postponed. The meteorological explanation is conspicuously absent. If you think you've seen this movie before, it's because you have. The article by Bruce Cheadle of the Canadian Press on the use of the term “Harper Government” does your readers no favours by presenting speculation and unsubstantiated innuendo and ignoring readily available facts. Over the weekend, the little web gnomes in VOCM Valley ran the important question, "Do you think the province is moving in the right direction by recommending Elizabeth Matthews for the vice-chair position at the C-NLOPB?" The final result, which was totally spontaneous and not at all gamed by anyone, was 76% yes, 20% now, and 4% not sure, although at several points during the weekend, the numbers were as low as 50-something yes to 40-something no. The total number of "votes" cast was 14,252 — the highest since the December 3 question, "Was Danny Williams our best premier?" (22,853) which was decidedly mixed. The totally spontaneous and unorchestrated outcome in that vote was 30% yes, 45% no, 24% not sure. The Speaker: The hon. member will restrain herself in that respect. She knows it is out of order to use the names of members in the House. Clever as it may be to do that in the chamber, we will avoid that. The Speaker: Order, please. Members must not use the name of another member of Parliament in questions or comments. This is the second time today that this has happened. This cannot continue. Mr. Mario Laframboise: Mr. Speaker, we cannot say his name in this House, but they can use it in government advertisements. That is shameful. First we had party fundraising letters from the Minister of Citizenship, Immigration and Multiculturalism and Conservative Party logos on government cheques, and now the Conservatives are once again confusing the interests of the Conservative Party and the activities of the government. When will the Conservatives stop using government resources to promote their party? We realize it’s difficult for some politicians to walk away from all the excitement of running the show and being in the public eye, but these three and those like them should realize they had their shot at making a difference in this province. They should let those in charge now do what they think best ... without all the harping from has-beens in the cheap seats. The paper's opinion has already been savaged, and properly so, here and here... to say nothing of the comments on the editorial itself and elsewhere on teh internets, but, remarkably, this is only one of the two stupidest editorials that the Western Star has published in the last nine months. And not necessarily the very stupidest of the two. This corner, for one, is looking forward to one of next week's Western Star editorials, which will roundly criticize Yvonne Jones, Roger Grimes, and possibly Clyde Wells, Steve Neary, Ed Roberts, Joey Smallwood, Jack Pickersgill, and Sir Robert Bond, for the appointment of Elizabeth Matthews to the Canada-Newfoundland and Labrador Offshore Petroleum Board. The Government of Canada, the government formerly known as Canada's New Government, has a new name that doesn't have "New" in it. The Maclean's, The CTV, and The Globe don't seem to be overly impressed. Where were they for the past eight years? Well, besides shopping for kid gloves, that is? But is it a long-form census? As part of the ongoing research and management efforts for woodland caribou on the island portion of the province, a mark-resight population census is now underway [sic — L. Matthews would never have allowed this illiteracy] on the south coast caribou herds. The survey is taking place west of the Bay d’Espoir Highway and south of the Trans Canada Highway, and involves the Pot Hill, Gaff Topsails, Grey River, Buchans and La Poile caribou herds. As part of a mark-resight census, there is a requirement for a number of caribou to be marked using a highly visible red paint. Once a number of animals in the herd have been marked, they are counted, and the relative ratio of marked animals versus unmarked animals establishes the total population estimate for each herd. Neither the marking of the caribou, nor the paint itself, poses any harm to the animal. As the marked caribou lose their winter coat in the spring, the red marking will also disappear from the animals. The public are also advised that low-level flying aircraft will be used in the area to conduct this census work. The census will be ongoing until the end of March. The release is conspicuously vague on what role, if any, Université Laval will play in counting caribou this time. The Provincial Government today confirmed that Elizabeth Matthews has been nominated for the position of vice-chair with the Canada-Newfoundland and Labrador Offshore Petroleum Board (C-NLOPB). The appointment of this position is a provincial-federal process. Nominations are provided to the Government of Canada. Their concurrence is required before an appointment can be made. The C-NLOPB is the regulatory agency for the Newfoundland and Labrador offshore area with staff who provide expertise and support in a variety of areas including safety, environmental protection, resource management, and industrial benefits. Now, for the record, what are Ms. Matthew's "broad policy experience, and an extensive communications background"? Elizabeth Matthews has gained solid experience in government, serving for the past six years in communications roles in the Opposition Leader's Office and in four government departments: Mines and Energy; Tourism, Culture and Recreation; Fisheries and Aquaculture; and Education. Prior to serving in the public sector, Ms. Matthews completed her post-secondary studies at Memorial University, and she worked in communications and sales in the private sector. She has played a key role with the Williams team during the election and throughout the transition to government. Heather Maclean, the good communications foot-soldier who was despatched on Thursday afternoon to polish this particular turd, first shows up as a media contact for a DanGov department in December 2004. She is, consequently, almost as qualified as Ms. Matthews to sit as Kathy Dunderdale-Government's nominee on the Canada-Newfoundland and Labrador Offshore Petroleum Board.